Preheat oven to 350º F. Lightly spray 9 x 13-inch baking dish with vegetable oil spray. In small bowl, combine 1/8 cup mozzarella and 1 tbsp parmesan cheese. Set aside. In medium bowl, combine remaining mozzarella and parmesan cheese with all of the cottage cheese. Mix well and set aside. Combine tomato sauce with remaining ingredients. Spread thin layer of tomato sauce in bottom of baking dish. Add third of noodles in single layer. Spread half of the cottage cheese mixture on top. 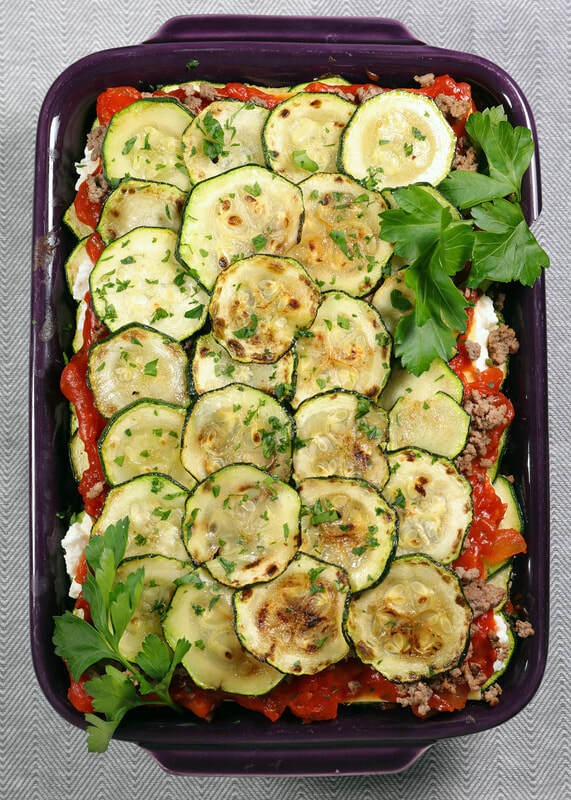 Add layer of zucchini. Add thin coating of sauce. Top with noodles, sauce, and reserved cheese mixture. Cover with aluminum foil. Bake for 30-40 minutes. Cool for 10 to 15 minutes.